Doggie Daycare - The Crate Escape, Inc.
Doggie daycare at The Crate Escape and The Crate Escape, Too is something all the dogs are barking about! 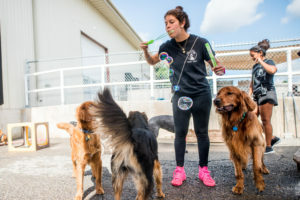 Our specially trained dog care attendants carefully group the dogs based on size, age, temperaments, and play styles so that everyone has a fun-filled play day. Daycare at either of our two Vermont locations allows your dogs the opportunity to get tons of off-leash exercise, increase their social skills and practice their manners. After a day of daycare with us, your dog will come home tired, happy, and well behaved. 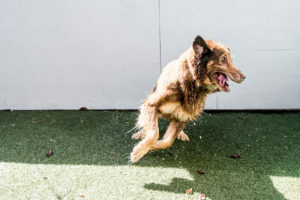 We offer a number of fun one-on-one special services and grooming services that can be added on to your dog’s stay with us to give him or her additional activities to take pleasure in. Our main playgroups are constantly supervised to ensure that all play is mutual, appropriate, and safe for all participants. Dogs play on our playground equipment, wade in our pools, and romp and hang out with their buddies inside and outside, depending on the weather. We limit the number of dogs we care for, so that EVERYONE gets lots of love, attention, and exercise. We perform daily behavioral and physical evaluations on every dog in our care. Both locations also offer fenced-in outdoor play areas so that everyone can enjoy the fresh air. We are the ONLY local doggie daycare provider offering a Veterinary Care Warranty program – free of charge – to our daycare clients. We take the time needed to acclimate dogs with poor social skills or those that are fearful. Please bring you own food if your dog requires feedings during the day. Dogs with social anxiety should bring a few belongings or treats in the event that an appropriate play group be unavailable for that day. Young puppies should bring a toy or treat to chew on. Dogs that require coats during cold weather should bring them. All dogs MUST arrive wearing their own flat buckle collars or they may purchase one from our retail section. Unacceptable collars include: martingale, prongs, choke chains as well as any loose fitting harnesses or those designed only for walking dogs. Flea collars will be removed so that they are not able to harm your dog’s playmates. Please See Requirements for more info.